Kent Athletic striker Pat Daly bagged a hat-trick as his side won 6-0 at Cuffley in the Anagram Records Feeders Leagues Trophy on Saturday. Jason Penman, Simon Richards and Nathan Henry were all on target too as the visitors made comfortable progress. In SSML Division Two, The 61 FC (Luton) fell to a 2-1 home defeat against Amersham Town. Brandon Pickard scored the only goal for the hosts, while Amersham triumphed despite being reduced to 10 men when Amal Cohen was sent off. 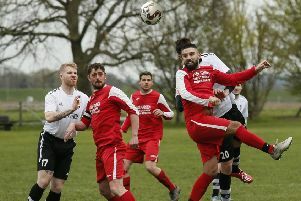 Substitute Oliver Buckley was the star for AFC Dunstable Reserves as they won a 13-goal bonanza 8-5 at AFC Kempston Reserve in the Beds Intermediate Cup. He came off the bench to score five times, while Glenn Thompson netted twice, with George Biggadike on target. Crawley Green saw off Langford in the same competition thanks to goals from Reece Green, Adam Marsh and James Potter. In Reserve Division North & West, The 61 FC (Luton) lost 2-1 at Mursley United, while the Reserve CHallenge Trophy saw Totternhoe beaten 2-1 by Holmer Green. This weekend, Crawley Green visit Cockfosters, while AFC Dunstable travel to Welwyn Garden City and The 61 FC (Luton) head to Buckingham Athletic, all in the league.